American jets hit targets in Syria on Tuesday in the US-led fight against Islamic State. Although the US has not declared war since 1942, this is the sixth country that Barack Obama, the holder of the Nobel Peace Prize, has bombed in as many years. The US and NATO started a bombing campaign in the north of the country on Tuesday against Islamic State militants, who have taken over parts of the north and east of the country. The death toll from Tuesday’s campaign was put at 70, though this figure could rise, according to the Syrian Observatory for Human Rights, who also said that eight civilians had lost their lives. 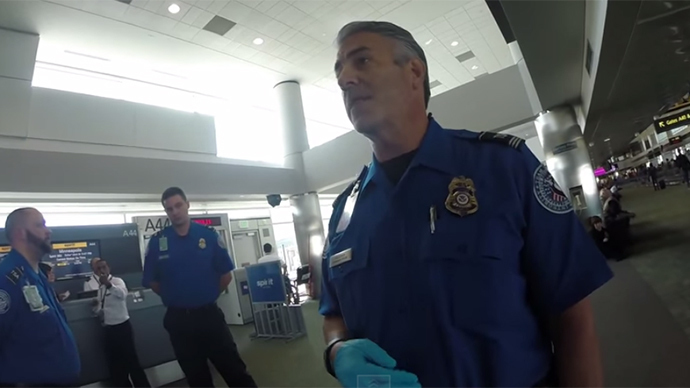 ​A man was recently stopped by TSA agents in the Denver International Airport and asked to undergo additional screening after he had already flown from Minneapolis. The man refused their requests, capturing the encounter on video. Kahler Nygard says he has assumed based on his treatment at airports in recent years that he has a low-level designation on the United States government’s no-fly list, possibly given past contributions to web forums that discuss anti-government sentiments, he said. Once he stepped off his plane that had just arrived in Denver, Nygard wasapproached by Transportation Security Administration officers who asked him to submit to an additional security screening. He resisted, asked why he was subject to a post-flight search. Nygard had a friend tape his initial screening before the flight, where he was “thoroughly screened” but had no problems. But while the merits of whether or not law enforcement officers should legally be able to collect sensitive cell information by masquerading as telecommunication towers remains ripe for debate — and continues for certain to be an issue of contention among civil liberties advocates — newly released documents raise even further questions about how cops use StingRays and other IMSI-catchers to gather great chunks of data concerning the whereabouts of not just criminal suspects, but seemingly anyone in a given vicinity that happens to have a phone in their hand or pocket. A fresh approach to the fight with the fatal Ebola virus has been revealed by Liberia, the World Health Organization and partners: infected people are set to be transferred to special centers with basic care. The initiative is expected to be launched in the next few weeks, and is aimed at reducing the risk that the families of the patients will contract the deadly virus from their relatives. The newly set-up “care centers,” as the authorities are calling them, would consist of 15 to 30 beds, with as many as 70 centers established across the country if the move is successful.